Durable Carhartt work clothes, casual Carhartt clothing and boots for hard working men, women and kids. Your Savings will be applied automatically on the Dungarees.com website. For Men - Explore the Carhartt clothing collection for men, featuring hardworking clothes for work, outdoor adventures, and every day. Besides a staple selection of rugged Carhartt dungarees and jeans, bibs and coveralls, you'll find casual styles including men's button-up shirts, t-shirts and knits, jackets and outerwear, sweatshirts, vests, pants and shorts, plus a specialty selection of rainwear, hi-vis and flame resistant clothing that will work just as hard as you do, come rain or come shine. For Women - From scrubs to waterproof jackets, Dungarees.com knows how to outfit today's hardest working women. Browse a female-friendly supply of Carhartt clothing for women including Carhartt shirts and knits, cargo pants, cropped pants and jeans, shorts and bibs, coats and jackets, vests, socks, rainwear, and hi-visibility clothing with advanced safety features built into every piece, offering protective options that are guaranteed to keep you safe and seen while outdoors and or on the job site. For Kids - Find a heavy-duty line of Carhartt clothing for children, with styles that are durable enough to keep up with the most active kids on the block. Find a sturdy selection of boy's and girl's clothing that will fit infants from 3 months of age to toddlers, youngsters and teens. Browse baby onesies, toddler bibs, little boy and girl t shirts and shorts, mini Carhartt dungarees, jackets, hoodies, sweatshirts, caps and hats that will keep their heads cozy and warm through the winter seasons. Footwear - Besides featuring the leading selection of Carhartt work clothes online, Dungarees.com also outfits your feet with a tenacious selection of boots and footwear styles for men, women and kids. Shop by brand, style or gender from an exceptionally crafted collection of shoes including Carhartt boots for men and women, durable Danner boots, Wolverine boots, Bates boots, and waterproof Muck boots for the entire family. Choose from steel-toe, soft-toe or composite-toe boots that are built to withstand everything from lawn and garden chores to farm and ranch work, and ready to tackle any terrain and/or activity you have in mind. Luggage & Accessories - Shop an indestructible supply of Filson luggage, bags and briefcases that will protect your personal belongings whether you're traveling near or far, to work or on vacation. You'll also find a handsome supply of wallets, belts, caps, hats, hoods and gloves, as well as state-of-the-art Stanley mugs and thermoses, sporks, survival kits, and more gifts and gadgets that will please any outdoorsman. 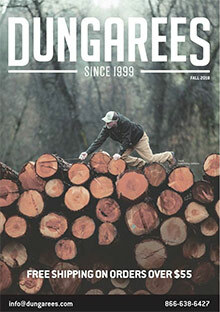 Dungarees.com brings you online access to a reliable selection of Carhartt work clothes and styles suitable for any outdoor activity or season, featuring a tough-as-nails collection of casual and work-ready apparel and boots that will protect you at work, at play, and from the harshest elements.